Do you believe society would be better off if recreational drugs were decriminalized? We’ve put this question in our latest poll to Undergrounders (members) of our Underground Knowledge discussion group on Goodreads – and interim results show two thirds of participants believe that would be the case. Poll results to date show that 65% of participants believe society would be better off if recreational drugs were decriminalized, 20% are unsure and 15% believe society would be worse off. It depends a great deal on the drug. It would be better off to legalize a drug like marijuana. It would not be a great idea to legalize Meth, or heroin. I see the War on Drugs tied in with the Prison Industrial Complex…And the drug and prison industries are two of the most profitable on Earth…And that’s a real concern to me, especially when you consider most people are in jail due to committing “victimless crimes” (i.e. they never hurt anyone, but themselves). I can’t see any benefit in legalising meth, or heroin, or a number of other horrors. When I lived in Amsterdam the main crime was bicycle theft, the streets where safe and there were less addicts because it was legal it lost its appeal…It’s all politics, it got nothing to do with drugs!!! If all and sundry have access to meth, recall an awful lot of violent crime is meth related, so that would grow. If you have ever seen a true heroin addict after a good period of addiction, you would not see any benefit there. Portugal had a huge problem with drug users, especially heroin, and they have now legalised drugs. It is far from resolved, a mess building for decades won’t be cleaned in months, but they are making good progress. I see at least 2 dilemmas facing legalizing recreational drugs: They will be taxed to the max, making ’em prohibitively expensive and the 2nd being the cartels looking to make up for the loss. History tells us, definitively, that it’s better to legalize vices than make them illegal–which does not stop them and just adds a lot more crime, increases the number of victims and casualties, and enriches criminals. During prohibition, crime involving alcohol was rampant, gangsters got VERY rich and everyone (rich and poor alike) continued to drink. Right now there is a recognised problem with overuse of opioids, that is technically legally obtained drugs. Why would opening up the supply and letting everyone have a go make that problem less? There’s a massive financial incentive to make entire communities/nations addicted…the illegality is what drives not only drug syndicates and big cartels, but also more organized criminal elements within the CIA (the biggest profiteer from the War on Drugs it seems). HELL NO! I’m almost 37. I can proudly say I’m both alcohol and drug free. I’ve never tried weed, nor will I ever…Smoking weed would not make me a better or cooler person. What we need to do is obliterate the Drug Barons, smugglers, and unsafe drug cutters. We also need to be wise about which drugs we legalise. Akin to Prostitution, certain drugs need to be legalised, available from approved chemists; that the drugs are the genuine article is given. Add in tax and VAT [sales tax], and rip the heart out of this illegal industry. A fair price for a genuine product. We invite YOU to join our fast growing Underground Knowledge group! This global discussion group has been designed to encourage debates about important and underreported issues of our era. All you need is an enquiring mind and a desire to gain or share ‘underground knowledge’. In book two in our international thriller series The Orphan Trilogy we highlight the direct link many commentators and researchers are convinced exists between the Kosovo War and heroin. 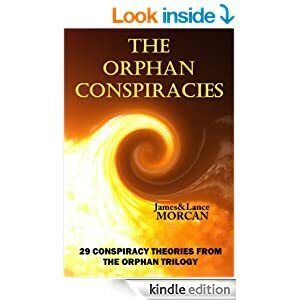 The above excerpt from The Orphan Factory was inspired in part by a discussion rumored to have taken place at the 1996 Bilderberg Group conference in Toronto, Canada. Its confirmed elite attendees included David Rockefeller, Henry Kissinger and Margaret Thatcher, and the discussion was said to have ended with the decision to create the Kosovo War. Bilderberger #1 may have said in passing that another war was needed to support the Military Industrial Complex. Bilderberger #2 may have mentioned that Kosovo had significant mineral reserves – since valued at more than 13 billion Euros – including silver, zinc, cobalt, lead, bauxite and lignite worth tapping into. Bilderberger #3 may have replied that the value of those reserves paled into insignificance next to the value of oil reserves of Middle East countries, and the gold and diamond reserves of several African countries. “Yeah, true, we gotta think big,” Bilderberger #4 may have added. After some head scratching, Bilderberger #5 may have reminded his or her fellow Bilderbergers that Kosovo lay smack bang in the middle of the infamous Balkan Route through which billions of dollars of heroin passed annually into western Europe from Turkey, Iran and Afghanistan. And his or her associates may have quickly deduced that whilst the value of Kosovo’s mineral resources may not warrant going to war over, the value of its drug trade – then believed to be worth around US$300 billion – was something else entirely. 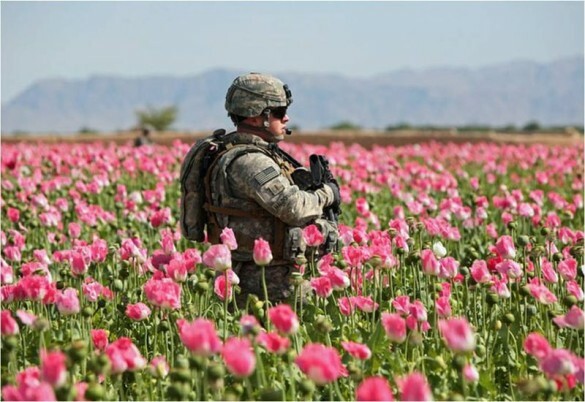 That imaginary discussion highlights one of the most disturbing conspiracy theories surrounding illicit drugs – in particular heroin and opium – and the disturbing role these drugs have played in recent wars. The infamous Balkan Route – a narcotic superhighway. Dope. Tar. White Nurse. Black Pearl. Hero. Big H. Snow. Boy. Junk. Smack. These are just a few examples of the seemingly inexhaustible slang terms people use when referring to heroin. Some, like China White or Mexican Mud, reflect location; others, like Dragon or White Girl, reflect popular songs while most are simply insider terms for those in the know. 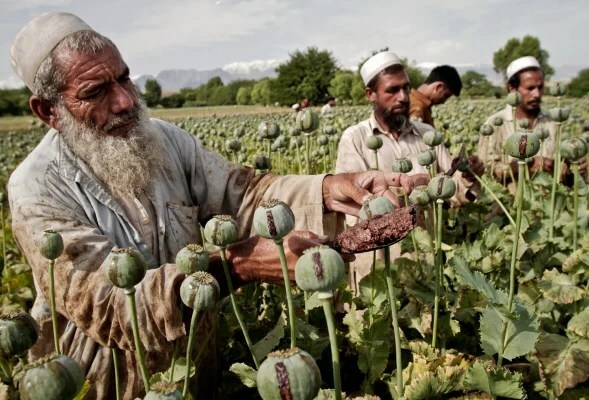 It’s worth noting the difference between heroin and opium because the two are often confused and because both are often referred to in the conflicts we wish to highlight – namely the Kosovo and the Afghanistan wars. Opium comes from the opium poppy (also known as Papaver Somniferum in scientific circles), whereas heroin is a semi-synthetic opioid analgesic, not an opiate. Most will be familiar with the Opium Wars that date back to the late 1830’s and involved Britain illegally trafficking opium into China and making enormous financial sums as a result. What’s less known is that heroin has been a cause of many a conflict – between countries, tribes and drug cartels – since it was first produced on a commercial scale as a wonder drug in the late 1890’s. 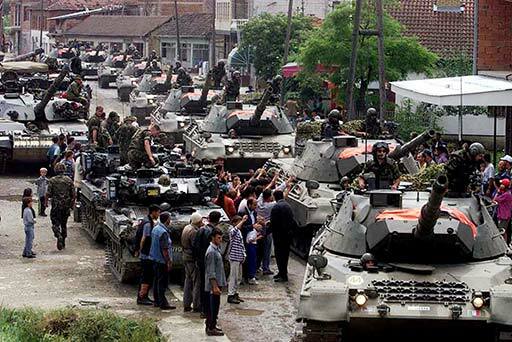 The brief but bloody Kosovo War was fought over 1998-99 between the ruling Federal Republic of Yugoslavia and the Kosovo Liberation Army (KLA) who, you may recall, received military support from NATO. Essentially, it was a conflict between the Orthodox Serbians and the Kosovo-Albanians. One of the enduring images from the Kosovo War. 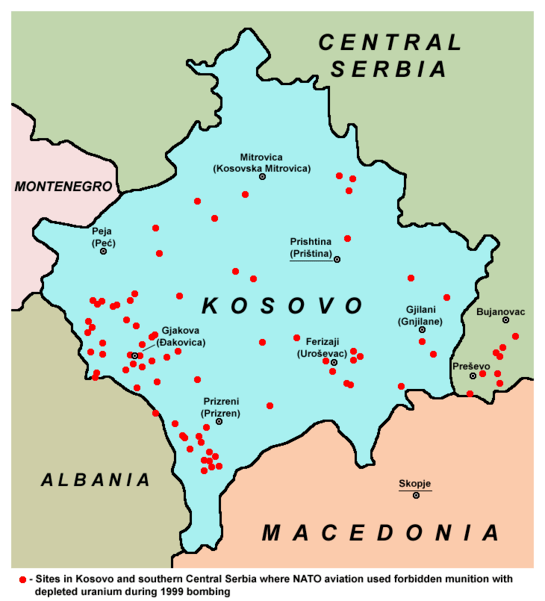 Armed with weapons smuggled in from Albania, the KLA attacked Yugoslav authorities in Kosovo, sparking a campaign of retribution by Serbs, which resulted in the confirmed deaths of many hundreds of KLA sympathizers – fighters and civilians – and a mass exodus of refugees. NATO then lent its weight to the conflict by participating in an aerial bombardment of Yugoslavia, attracting widespread controversy and condemnation, and prompting more than a few conspiracy theories. Even China chipped in, claiming the US was flexing its military muscle and expanding its presence and influence in Europe. Some critics of the NATO campaign, which occurred during President Bill Clinton’s tenure, even labeled it a diversionary tactic to deflect attention from Clinton’s recent embarrassing dalliance with Monica Lewinsky in the White House. All of these accusations were met with denials by the Clinton Administration, although the denials rang hollow in the face of the UN Security Council’s refusal to sanction NATO’s aggressive military involvement in the conflict. A refugee camp struggles to cope during the Kosovo War. It’s the role heroin played in the Kosovo War that has intrigued many independent researchers. Kosovo lies in the center of the Balkan Route through which nearly all Afghan heroin (the world’s most popular variety) passes through on its way to greater Europe and beyond, including the United States. The extraordinary value of the Balkans’ drug trade has been estimated to be worth anywhere from US$500 billion to one trillion dollars annually. There’s speculation the Western-backed KLA was heavily involved in this profitable business, adding fuel to the theory that the desire to control heroin trafficking was the underlying cause of the Kosovo War. Certainly, Kosovo Albanians are prime movers in the region’s illegal drug trade – second only to the Turkish mafia, according to US Drug Enforcement Agency officials who, in 2000, estimated that Kosovo Albanians controlled nearly half of Europe’s heroin. Those same officials said as much as 6 tonnes of heroin passed through the Balkan Route every month. In an article by The Guardian dated March 13, 2000, columnist Maggie O’Kane said international agencies fighting the drug trade were warning that Kosovo had become “a smuggler’s paradise” and “Nato-led forces, struggling to keep the peace a year after the war, have no mandate to fight drug traffickers…who are running the Balkan route with complete freedom”. Perhaps the foremost authority on drug wars is Canadian economist Dr. Michel Chossudovsky, author of The New World Order, whose extensive commentaries clearly convey that “the expensive Yugoslav conflict” was “directly linked to the multi-billion drug war”. In an exclusive interview dated June 30, 1999 in cannabisculture.com, Dr. Chossudovsky says, “Drugs serve political interests … They help finance covert intelligence operations … the Vietnam War, the generals in Haiti, the Contras, Colombian paramilitaries … Many groups are funded with drug money that serve geopolitical interests. And there is usually covert support provided by the CIA to these groups. “It is well documented the KLA is financed by the drug trade. It also has links to the CIA, German intelligence and Islamic terrorist organizations. So Islamic terrorist organizations the West has labeled as its enemies are co-financing the KLA alongside NATO. It’s a totally absurd situation”. 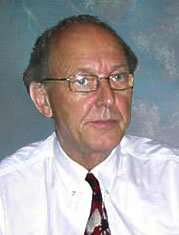 Dr. Chossudovsky also alludes to drug profits being laundered to buy arms in post-war Kosovo. The motivations for creating these drug wars, if indeed that’s what they are, is the massive profits the global elite can derive from their well-documented drug trafficking. Which begs the question: why are drugs so profitable? Essentially, many argue, it’s because they are illegal. By making drugs a criminal enterprise, it creates an enormous black market economy where drugs fetch far greater prices than they would if legal. Many authors and independent media outlets have repeatedly suggested the War on Drugs is a money-making scheme and doesn’t actually prevent drug usage or reduce the number of addicts. They point to countries like Portugal, the Netherlands and the Czech Republic, which have all decriminalized drug usage to varying degrees and have subsequently experienced a decrease in the amount of drug-related crime and a reduction in the incidence of drug addiction. In an article dated January 23, 2014 and headed World leaders slam war on drugs as ‘a disaster’, CNBC comments that the “decades-long war on drugs has failed and the world’s lawmakers need to consider decriminalization”. Former UN Secretary General Kofi Annan is quoted in the article as saying the War on Drugs “has been a disaster and has inflicted enormous harm … Drug use is not down. It’s time for a different approach. Drugs have destroyed many people, and the wrong government and policies have destroyed many people”. 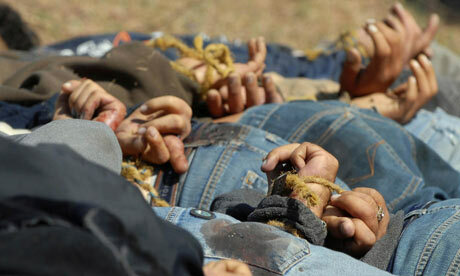 Drug war casualties (above and below)…no end in sight. Possibly interrelated to the theory that drugs are prohibited to fuel the highly profitable international drug trade, is the privatization of prisons that has occurred in America and throughout much of the Western world in recent decades. Something that started happening around the same time the War on Drugs began. Privatized prisons could be viewed as an adjunct to the previous chapter, which covered secret prisons. In the West at least, these privately-owned, non-government facilities can’t be classified as secret prisons in that they are not off-the-grid or unknown to the government. However, according to conspiracy theorists, they are secretive in so far as they don’t disclose their true agendas. Once prisons are privatized, they need prisoners to make a buck or they’ll go out of business. That’s the economic reality. Some critics of the privatized prisons business claim that it’s open to corruption and suggest that private companies running these prisons have been known to collaborate quietly with law enforcement officials to ensure their prisons are full of inmates. The obvious candidates to target – after murderers, rapists and drug-pushers of course – are drug-users, according to those who promote this theory. If true, then the War on Drugs may also be a scam designed to put users in prison and keep them there. Remember, it’s a fact that a large percentage of prisoners around the world have committed victimless crimes involving drugs. And like the War on Drugs itself, the privatized prison system is highly profitable. Could it be this war and these privatized prisons are some kind of two-fold, money-making scheme of the elite? Or are we getting a bit paranoid here? 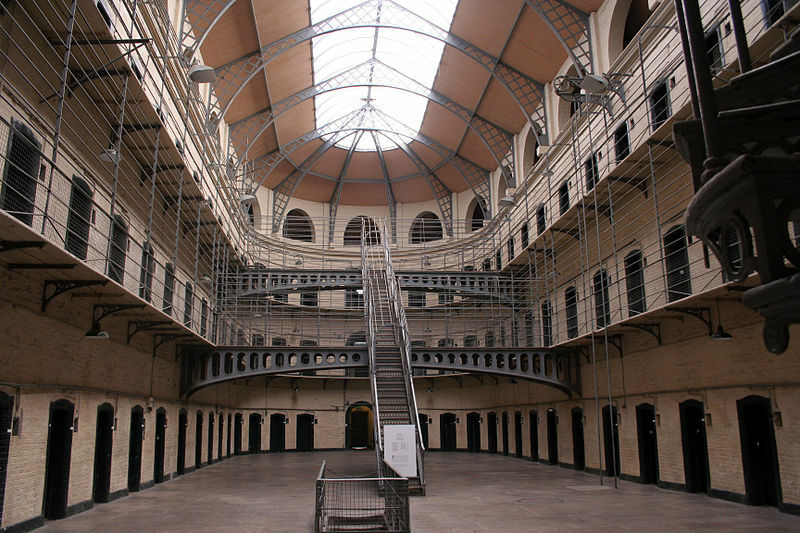 Private prisons like this one need prisoners to make a buck. “I’ve seen people I love die from this disease (drug addiction). Now we have a chance to at least demonstrate that this isn’t what people feel about this issue anymore … People don’t want drugs to be illegal anymore, they don’t want their heads of politicians buried in the sand.” –Russell Brand, from television interview on February 13, 2014 on the UK’s Channel 4. 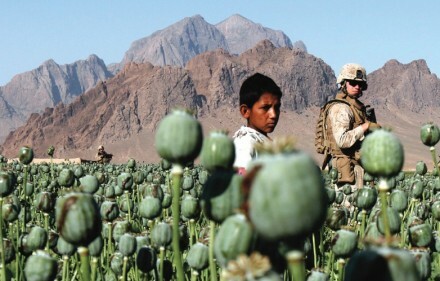 If this entire conspiracy theory on drug wars is wrong, fictitious, over-egged or, heaven forbid, just plain loony, another scenario is very possible: this scenario is that drugs are simply one of the many fortuitous and spontaneous spoils of war, and while the global elite may not actually be starting wars to financially benefit from drug-trafficking they sure as hell do alright out of it. Even in mineral-rich and oil-rich war-torn regions like the Middle East, illicit drugs and the huge profits to be made from them are a nice added bonus, wouldn’t you agree? And even if there is no ulterior motive surrounding the War on Drugs – a very big IF – the bottom line is the drug prohibition program hasn’t remotely worked; the international drug trade is expanding, not contracting, and drug usage is increasing worldwide. We don’t remotely support drug use. The horrors that illicit drugs inflict on individuals and on society in general are there for all to see. However, the problem is one that may be with us forever because it does seem that drugs and profits cannot be separated, and history shows that where large profits are to be made, corruption flourishes. Meanwhile, excuse us for one moment. It’s time for us to take our medication again!